Just a quick update from me this week. As those of you who follow me on social media will know, this week I celebrated a 'big' birthday and so I have been a bit unprepared with all the celebrations going on ;-) I did however do a bit of shopping this week again! We made an impulse buy of a lovely mirror and a photo frame for our utility/downstairs toilet as well as some paint samples and a roll of wallpaper. On a whim! So not something I would normally do. The picture frame is for some photos that Hubby B took on our holidays and this particular space is going to be nautical themed. I will post some pictures of all of our goodies very soon and I am so excited to get this project underway. Hoping you will join in with #MakingHome this week. With it being the week of my birthday I would love to see a few posts on handmade gifts, maybe cake recipes or party themes. All other posts welcome too of course! 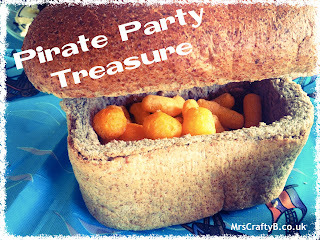 Here's a contribution from me; a treasure chest made from a loaf of bread for a pirate themed birthday party! oooo I love a good birthday. I can't wait to see what the next ten years brings my way (or what I do with it). I definitely didn't freak out like some of my friends haha. Thanks for the birthday wishes!